Irecord $5.45 million the highest amount ever raised. Ipaign goal of $6 million is definitely attainable." Last year's final total was $4.78 million. with South Broward's 30 percent. Broward is South (Palm Beach) County, which is highest." Mrs. I "In nteers manned the special phones set up for the day at the Jewish $50,000. For more photos of the day's events, see Page 2-A. Jth Broward audiences last week. V'.inon situations into "a Mideast solution"
hii'. the army of fleer said. have) at any time, Gazit said. the Israeli officer. "We know the Americans (U.S.
example, check for a permit to carry that weapon. If you don't have a permit, you are arrested." trophic results should a U.S. Marine get shot. Continental man next ambassador to U.S.? i the most logical choice. department and Secretary of Defense Caspar Weinberger. The Romanian-born Rosenne, 51, has lived in Israel since 1948.
viously held the post of Israeli consul in New York. allowing Anwar Sadat's historic journey to Jerusalem. (s premature and not suitable for discussion. tpblems are not yet solved." St., Hollywood, 9 a.m. 5 p.m.
Lecture Series continues at 8 p.m.
sponsored by JCC; call 921-5511. 28, monftay "First Passover Seder. French government close the PLO office here in Paris." it is a question of to be or not to be." operate with the French in his prosecution," the ambassador said. Norman Morrison checks photo display at Jewish Federation of South Broward. Or. Robert I 'it it'll photographed what they saw. operating in each facility to burn the bodies. many as 8,000 Jews every hour were murdered. Stieber. Executive Director. Summer G Kaye Submit material lor publication to Leslie Silas. Out ol Town Upon Request. even after they have left office. before it could get to Teheran. Anyway, all that was before. first two causes, let alone both. creasing vigor to Islam." And. medical products. Or so we said. time of nuclear war, of course. selling their own nuclear facilities! many, where a national election! JUST AS the United States! nuclear arming of Egypt, neither! weapons to Mubarak has become! to be thankful for for its investment in Israel. flows onto its greatest ally: The United States. sein to join the peace talks "any day now." ranean, on Turkey, on Greece and on Iran. pull out of Lebanon until four conditions are met. until he or she is tried on the accusation. forces to leave Lebanon; a parallel agreemefl-. campaign, and Chavarut speaker J. Frederic Blitstein. Middle East Task Force, CRC; and (at podium) Rabbi Samuel Rothberg of Temple Beth El. what it means to be a Jew. lous "Fun Ships"- Camivale, Festivale. Wonderful Occasion at. YOUNG CIRCLE. HOLLYWOOD. F|_. II 00 AM-4 OOP. M.
leaving a legacy to Hadasaah today! from left are Ann Shapiro. Herman Schulman, Nellie Lerner and Bert Shapiro. by Judge William Mars Jones. received a 35 year sentence. work with him or her from birth." normal child but very special." are no longer hidden burdens. Ft. Lauderdale; and Dr. Abraham Fischler, president of Nova University. our cash collection total counts the most. is an outpouring of cash from our campaigns. good for rich people," or "I don't need any tax deductions." help people of every age and socio-economic category. not need the help of the Legacy and Endowment Fund. simultaneously receive a tax deduction? 3. How a philanthropic fund can save you money? 5. How to minimize estate taxes, painlessly? from it at the same time? considering their future in Israel. precious, should be wanted . their unique and loving care. and Bob and Shane Wolf. Lebanon) fairly to say the least." munity that is very much alive and proud of its Jewishness." possibility that he might become ambassador to the United States! state to make sure our heritage is transmitted to a new generation! and to make sure the world never forgets." win support from the coalition. Women has presented its highest honor, the Hannah G.
flanked by Irene Spatter (left) and Sheryl Sherman. For haip wtth your naadi.
. MONTE 17-QZ CANS SWEET PEAS CftOnWK. Low in calories, tastes good...Seafood! nearly two years, "holding up"
Community Centers of South Broward'* nameless newspaper. grants as well as scholarships. 2100 E. HaHandale Beach Bhrd. during a recent brunch at Galahad III. Max Taraza and Irma and Joe Deutsch. that people will forget it,"
can begin the emigration process. their culture and their language." Jews of the Soviet Union. cently received a "refusal for life"
been permitted to return to Tula. visits during his term in camp. in imprisonment and is now sick. labor camp on similar grounds. |EAD TPflTMATZAH OF HOPE AT YOUR SEDER. 1. the law will not be applicable. ^maSS ^CUy QUAUTY JEWISH FOODS SINCE 5649 V^fT"
breakfast; UJA-Federation contributions more than tripled. offered in the United States,"
MELVIN D. ROSS, M.D., P.A. vitamins and minerals. So when peoplesee me drinking it. one coupon per purchase SUNSWEET GROWERS. INC.
Lucile Baer witness the event. 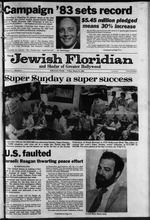 recent United Jewish Appeal-Jewish Federation of South Broward Campaign '83 brunch. East 53 St. New York, N.Y.
tion of the Second Temple. But. from left are Jules B. Newman, Michael R. Schlander and Mitchel Bricker. 2500 E. Haliandale Bch. Blvd. the Federation is Reva Wexler. ace the possibility of losing vital human services. [these cries and display our utmost commitment." and concerns of their people, locally and in Israel." used throughout the Seder evening. That Is ManlschewlU. of course. always there Is the ManlschewlU. rabbi to answer, please address a letter to Rabbi Avrom L.
Drazin, c-oJFSB, 2719 Hollywood Blvd., Hollywood, FL 33020.
national entity of the Jewish people. responsible for Jews to champion freedom in the world. subordinate to the whims and whips of individuals. accepted a moral code, a constitution based upon Divine Law. needed the third feature of the Book of Exodus. unified whole or holy person." Sunday, April 10th, 7:30 P.M.
Meet the "Family of Solel"
Temple Bath El 1361 S. 14th Ave.. Hollywood; 920-8226. Road. Pwmbrok* Pines: 431-3638. Rabbi Bennett Greenspon. ning, 10:30 o'dock.Heligioue school: Pre-school-12. Ited by the Jewish Community Centers of South Broward. \, Esther Levine and Hyman Steinberg. and seated, from left, Rose Rabinowitz, Kay Lowy and Bea Mallet. plaincy Services at Federation, at 921-8810. IELVIN D. ROSS, M.D., P.A. Florida region officers, and Lou Hymson and Marvin Beckerman. men s district 5 officers. lh' parn-rva-i" secretion of insulin. lack of fiber in the modern diet. v r*w> m Ow nioftriwi. Bond Committee has set Sunday. Israel Bond brunch on Sunday. American life "from the inside"
about crime and medical services. where carpets are to be found. clerk make the effort to find it? get what one wants or needs. thropologists, such as Dr. Katz. not shy away from controversy. includes: water ski. canoe, sail. swim (2 heated pools), tennis. And it's a lot easier without. general anxieties," Dr. Katz said. er, or even rabbi is private. l>art of a person's 'file,' Dr.
based upon fame and-or wealth. driving an expensive new car." from a not her world." "opened the unknown to us . schools," Mrs. Yudena found Dr.
with sweets tor the sweet. works in Russia." she continued. to become intimate or to "help. ation of South Broward, Mrs.
pick up on, she says. Kiras run a real estate firm. sure kept Jews from the temple. in Broward in Jewish activities. Shelters 26 seniors under contractual subsidized rents. Includes land, pool, 16 unit bldg. and all facilities. Sellers will finance with V down. Hallandale Blvd.-shopping area. Excellent opportunity! 5827 Johnson St. Hollywood. Fl. Can B'nai B'rith Count On You? "Reach Out and Touch Someone "
than the Jews." the scholar. Dr.
tj "Exists a "credibility crisis"
feels good to feel guilty. " "perfect, full of love, goodness"
ly that it could not happen again. Israel and not the Holocaust." hold with the German people. 1984, the same as this year. mended "for the military grant"
"ignore" the will of Congress. could be considered a "sanction." tlements on the West Bank. questions about aid to Israel. vivors, to be held here from Apr. full participation in all events." CatskiU Mts., Liberty, Swan Lake, N.Y.
something so tiny made N so Mg.
Sabra and Shatila refugee camps. we'll send you $1 by mail. PtMBf anow a wanks to facatva your choc*. Bud Homans, South Broward Council Phon-A Thon. 20 to April 8. Paul L. Backman. able to reach all our members,"
local high school age groups. repair the damage without delay. home or auto key duplicated free. Eving as an armed camp"
> breakfast at the White House. get to the (negotiating) table." ally, "What is at stake for Israel? to sign peace treaties with them." Arab states will be moderate. ready have a state, "Jordan." the security of northern Israel. 4S25 Sheridan St.. Hollywood. Fla.
verbiage" of his earlier position. DO YOU LIVE ALONE ? Cresthoven East may have the answer. the security of South Korea. rael seeks no contribution of U.S.
combat forces on its behalf." ; London parish of Stepney. in the Gospels of St.
following for Summer Camp: Head & Asst. acher with camping survival techniques experience. Strolling on the beach at Caesarea. tAirfares slightly higher between March 22-March 28, June 19-July 15 Cancellation penalty applies. Add $300 departure tax. All airfares subject to change and government approval. Land packages from $319 to $ 1385 per person, double occupancy, excluding airfare.